Ishpekova, B., Milanov, I., Hristova, L.
II ed. Unison Art EООD, Sofia, 2011, 546 pp. Panchev, P., Spasov, V., Lesev, M., Genov, G., Milanov, I., Zasheva, Z., Tokov, P., Kaludiev, E., Sirakov, M., eds., Family medicine. ELDO, Sofia, 2000, 975 pp. Panchev, P., Romanski, K., Mavlov, L., Milanov, I., Stoilov, P., Naumova, E., Tokov, P., Lambreva, L., Concheva, A., Kojchev, G., Zasheva, Z., Turnovska-Kudreva, P., Kostadinov, D., eds., Differential diagnosis and therapy. ELDO, Sofia, 2001, 702 pp. Milanov, I., Panchev, P., eds., Urgent conditions in family practice. ELDO, Sofia, 2001, 536 pp. Nachev, G., Milanov, I., Panchev, P., Turnovska-Kudreva, P. Modern clinical medicine. ELDO, Sofia, 2002, 540 pp. Ishpekova, B., Milanov, I., Hristova, L. Clinical electromyography. I ed., Unison art, Sofia, 2003, 644 pp. Milanov, I., Stranski, L., Panchev, P., Kostadinov, D., Mitov, I., Doganov, N., Kraev, Z., Uzunova, I., Donkov, I., Ognjanov, S., Elenkov, Ch., eds., Modern therapy in clinical medicine. ELDO, Sofia, 2004, 246 pp. Milanov, I., Bozarov, A. eds., Handbook for diagnosis and treatment of the most common headaches in primary medical care. Cephalgia, 2009, 11, 1, 48 pp. Milanov, I. ed. Practical psychiatry. Part I. General and special psychiatry. Asya – Rosen Mladenov, Sofia, 2009, 390 pp. Milanov, I., Stamenova, P., Jancheva, St., Petkov, D., Djenev, T., Penev, N. Handbook for behaviour of the general practitioners in patients with headache. NSOPLB, Sofia, 2010, 48 pp. Milanov, I., Stamenova, P., Jancheva, St., Petkov, D., Djenev, T., Penev, N. Handbook for behaviour of the general practitioners in patients with headache. NSOPLB, Sofia, 2011, 48 pp. Milanov, I., Georgiev, D., Chipilski, L., Bajkushev, S., Chakurov, D., Stamenova, P. Bulgarian algorithm for diagnosis and pharmacological treatment of early Parkinson’s disease. Polygraphia A.D., Plovdiv, 2000, 47 pp. Milanov, I., Chipilski, L. Bulgarian algorithm for diagnosis and treatment of primary headaches. Cephalgia, 2000, 2, 2, 24 pp. Milanov, I., Georgiev, D., Chipilski, L. Bulgarian algorithm for diagnosis and treatment of multiple sclerosis. Pamporovo, 2000, 36 pp. Milanov, I., Chipilski, L. Bulgarian algorithm for diagnosis and treatment of back pain. Cephalgia, 2001, 3, 2, 21 pp. Milanov, I., Georgiev, D. Bulgarian algorithm for diagnosis and treatment of late Parkinson’s disease. Cephalgia, 2002, 4, 2, 40 pp. Milanov, I., Bulgarian algorithm for diagnosis and treatment of multiple sclerosis. Movement Disorders (Bulgaria), 2005, 2, 1, 36 pp. Milanov, I. National consensus for diagnosis and treatment of primary headaches. Cephalgia, 2009, 11, 2, 28 pp. Milanov, I. National consensus for diagnosis and treatment of neurological pain. Cephalgia, 2010, 12, 1, 62 pp. Milanov, I. National consensus for diagnosis and treatment of Parkinson’s disease. Movement Disorders (Bulgaria), 2010, 7, 2, 32 pp. Milanov, I. National consensus for diagnosis and treatment of multiple sclerosis. Movement Disorders (Bulgaria), 2011, 8, 1, 39 pp. Milanov, I. National consensus for diagnosis and treatment of epilepsy. Movement Disorders (Bulgaria), 2011, 9, 2, 47 pp. Stamenova, P., Milanov, I. National consensus for prophylaxis, diagnosis, treatment and rehabilitation of cerebrovascular disease. Bulgarian Neurology, 2011, 11, 4, 185-215. Milanov, I. National consensus for diagnosis and treatment of immune mediated polyneuritis and polyneuropathies. Movement Disorders (Bulgaria), 2012, 9, 1, 34 pp. Milanov, I. National consensus for diagnosis and treatment of multiple sclerosis. Movement Disorders (Bulgaria), 2012, 9, 2, 40 pp. Milanov, I., Stamenova, P. Algorithms for diagnosis and treatment of main neurological diseases. Bulgarian Neurology, 2012, 12, 2, 158 pp. Milanov, I. National consensus for diagnosis and treatment of Parkinson’s disease. Movement Disorders (Bulgaria), 2013, 10, 1, 32 pp. Milanov, I., Stamenova, P. National consensus for prophylaxis, diagnosis and treatment of cerebrovascular diseases. Bulgarian Neurology, 2013, 14, 3, suppl. 1, 170-189. Milanov, I. Bulgarian algorithm for diagnosis and treatment of multiple sclerosis. Movement Disorders (Bulgaria), 2014, 11, 1, 40 pp. Milanov, I., Bojinova, V., Turnev, I. National consensus for diagnosis and treatment of epilepsy. Bulgarian Neurology, 2014, 15, Suppl. 1, 66 pp. Milanov, I. National consensus for therapeutic plasmapheresis in neurological diseases. Bulgarian Neurology, 2014, 15, 1, suppl. 3, 155-169. Bojinova, V., Chavdarov, I., Milanov, I. Diagnosis, rehabilitation, treatment and administration of children with cerebral palsy. Consensus – revised and supplemented 2014. Bulgarian Neurology, 2014, 15, 3, Suppl. 1, 256-267. Ishpekova, B., Milanov, I., Stamenova, P., Shotekov, P., Belopitova, L., Bojinova, V., Georgiev, D., Daskalov, М., Kremenski, I., Novachkova, S., Turnev, I., Gergelcheva-Bliznakova, В., Litvinenko, I., Jordanova, А., Kulev, О., Bogdanova, D. National consensus for diagnosis, treatment and prophylaxis of neuro-muscular diseases, 2011. Titianova, Е., Stamenova, P., Girov, K., Petrov, I., Velcheva, I., Grozdinski, L., Stankev, M., Chervenkov, V., Hristova, Е., Stamenov, B., Karakuneva, S., Stajkov, I., Daskalov, M., Vasileva, E., Petrova, J., Bojinova, V., Staneva, M., Velchev, V., Stojneva, Z., Gozmanov, G., Deleva, N., Andonova, S., Petrov, I., Kastrev, S., Milanov, I., Traikov, L., Turnev, I., Haralanov, L., Klisurski, M., Zahariev, Т., Kenarov, P. National consensus for ultrasound diagnostics and behaviour in patients with extracranial carotid pathology. Neurosonology and brain hemodynamic, 2011, 7, 1, 63-83. Milanov, I. Bulgarian algorithm for diagnosis and treatment of multiple sclerosis. Movement Disorders (Bulgaria), 2015, 12, Suppl. 1, 42 pp. Milanov, I. Bulgarian algorithm for diagnosis and treatment of multiple sclerosis. Movement Disorders (Bulgaria), 2015, 12, Suppl. 2, 43 pp. Jancheva, S., Milanov, I., Georgiev, D., Shotekov, P. Motor action. In: Neurology. General neurology - part I. Jancheva, S., ed., Znanie EOOD, Stara Zagora, 1998, 49 – 82. Chavdarov, D., Milanov, I. Clinical neurophysiology. In: Neurology. General neurology - part I. Jancheva, S., ed., Znanie EOOD, Stara Zagora, 1998, 207 – 226. Daskalov, M., Milanov, I. Diseases of the peripheral nervous system. In: Neurology. Clinical neurology – part II. Jancheva, S., ed., Znanie EOOD, Stara Zagora, 2000, 43 – 64. Georgiev, D., Milanov, I. Degenerative diseases of the nervous system. In: Neurology. Clinical neurology – part II. Jancheva, S., ed., Znanie EOOD, Stara Zagora, 2000, 161 – 178. Jancheva, S., Milanov, I., Georgiev, D., Shotekov, P. Motor action. In: Textbook of neurology. Shotekov, P., ed., M.I. Arso, Sofia, 2001, 28 - 32. Chavdarov, D., Milanov, I., Shotekov, P. Special instrumental examinations of the nervous system. In: Textbook of neurology. Shotekov, P., ed., M.I. Arso, Sofia, 2001, 118 - 127. Milanov, I., Ishpekova, B. F-wave. In: Clinical electromyography. Ishpekova, B., Milanov, I., Hristova, L., eds., Unison Art EOOD, Sofia, 2003, 297-318. Milanov, I. Sympathic skin response. In: Clinical electromyography. Ishpekova, B., Milanov, I., Hristova, L., eds., Unison Art EOOD, Sofia, 2003, 509-514. Milanov, I. Somatosensory evoked potentials. In: Clinical electromyography. Ishpekova, B., Milanov, I., Hristova, L., eds., Unison Art EOOD, Sofia, 2003, 515-525. Milanov, I., Ishpekova, B. Reflexology. In: Clinical electromyography. Ishpekova, B., Milanov, I., Hristova, L., eds., Unison Art EOOD, Sofia, 2003, 527-579. Milanov, I. Examination of tremor. In: Clinical electromyography. Ishpekova, B., Milanov, I., Hristova, L., eds., Unison Art EOOD, Sofia, 2003, 581-591. Jancheva, S., Milanov, I., Georgiev, D. Motor action. In: Neurology. Shotekov, P., ed., M.I. Arso, Sofia, 2004, 30 – 43. Aleksiev, A., Milanov, I., Shotekov, P., Dimitrov, I. Special instrumental examinations of the nervous system. В In: Neurology. Shotekov, P., ed., M.I. Arso, Sofia, 2004, 131 – 149. Jancheva, St., Milanov, I., Georgiev, D., Shotekov, P. Motor action. В In: Neurology. Milanov, I., Jancheva, St. eds., Medicina i Fiskultura, Sofia, 2007, 26 – 59. Milanov, I. Pain. In: Neurology. Milanov, I., Jancheva, St. eds., Medicina i Fiskultura, Sofia, 2007, 69 – 75. Topalov, N., Milanov, I., Shotekov, P. Neuroimaging methods. In: Neurology. Milanov, I., Jancheva, St. eds., Medicina i Fiskultura, Sofia, 2007, 202 – 227. Kolev, P., Milanov, I. Clinical neurophysiology. In: Neurology. Milanov, I., Jancheva, St. eds., Medicina i Fiskultura, Sofia, 2007, 228 – 250. Milanov, I., Turnev, I., Daskalov, M. Diseases of the peripheral nervous system. In: Neurology. Milanov, I., Jancheva, St. eds., Medicina i Fiskultura, Sofia, 2007, 331 – 366. Rajchev, I., Minchev, D., Bojinova, V., Velcheva, I., Milanov, I., Deleva, H., Grigorova, O., Vasileva, T. Neuroinfections. In: Neurology. Milanov, I., Jancheva, St. eds., Medicina i Fiskultura, Sofia, 2007, 367 – 415. Milanov, I., Degenerative diseases of the nervous system. In: Neurology. Milanov, I., Jancheva, St. eds., Medicina i Fiskultura, Sofia, 2007, 495 – 537. Milanov, I., Headache. In: Neurology. Milanov, I., Jancheva, St. eds., Medicina i Fiskultura, Sofia, 2007, 645 – 655. Jancheva, St., Milanov, I., Georgiev, D., Shotekov, P. Motor action. In: Neurology for general practitioners. Milanov, I., Jancheva, St. eds., Medicina i Fiskultura, Sofia, 2009, 12 – 40. Milanov, I., Pain. In: Neurology for general practitioners. Milanov, I., Jancheva, St. eds., Medicina i Fiskultura, Sofia, 2009, 50 – 57. Topalov, N., Milanov, I., Shotekov, P. Neuroimaging methods. In: Neurology for general practitioners. Milanov, I., Jancheva, St. eds., Medicina i Fiskultura, Sofia, 2009, 136 – 153. Kolev, P., Milanov, I., Clinical neurophysiology. In: Neurology for general practitioners. Milanov, I., Jancheva, St. eds., Medicina i Fiskultura, Sofia, 2009, 154 – 171. Milanov, I., Turnev, I., Daskalov, M. Diseases of the peripheral nervous system. In: Neurology for general practitioners. Milanov, I., Jancheva, St. eds., Medicina i Fiskultura, Sofia, 2009, 222 – 256. Rajchev, I., Minchev, D., Bojinova, V., Velcheva, I., Milanov, I., Deleva, H., Grigorova, O., Vasileva, T. Neuroinfections. In: Neurology for general practitioners. Milanov, I., Jancheva, St. eds., Medicina i Fiskultura, Sofia, 2009, 257 – 306. Milanov, I. Degenerative diseases of the nervous system. In: Neurology for general practitioners. Milanov, I., Jancheva, St. eds., Medicina i Fiskultura, Sofia, 2009, 363 – 408. Milanov, I., Headache. In: Neurology for general practitioners. Milanov, I., Jancheva, St. eds., Medicina i Fiskultura, Sofia, 2009, 520 – 533. Milanov, I., Georgiev, D. Motor action. In: Neurology. II ed., Shotekov, P., ed., M.I. ARSO, Sofia, 2010, 42 – 55. Milanov, I. Specialised instrumental examinations of the nervous system. Electromyography. In: Neurology. II ed., Shotekov, P., ed., М.И. АРСО, Sofia, 2010, 160 – 161. 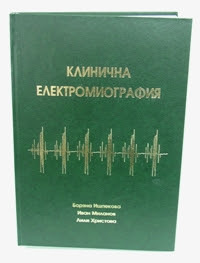 Ishpekova, B., Hristova, L., Milanov, I. Anatomophysiological background of electromyography. In: Clinical electromyography. II ed., Ishpekova, B., Milanov, I., Hristova, L., eds., Unison Art EOOD, Sofia, 2011, 19 - 49. Milanov, I., Ishpekova, B. F-wave. In: Clinical electromyography. II ed., Ishpekova, B., Milanov, I., Hristova, L., eds., Unison Art EOOD, Sofia, 2011, 247 - 267. Milanov, I. Sympathic skin response. In: Clinical electromyography. II ed., Ishpekova, B., Milanov, I., Hristova, L., eds., Unison Art EOOD, Sofia, 2011, 417 - 421. Milanov, I. Somatosensory evoked potentials. In: Clinical electromyography. II ed., Ishpekova, B., Milanov, I., Hristova, L., eds., Unison Art EOOD, Sofia, 2011, 423 - 431. Milanov, I., Ishpekova, B. Reflexology. In: Clinical electromyography. II ed., Ishpekova, B., Milanov, I., Hristova, L., eds., Unison Art EOOD, Sofia, 2011, 433 - 475. Milanov, I. Examination of tremor. In: Clinical electromyography. II ed., Ishpekova, B., Milanov, I., Hristova, L., eds., Unison Art EOOD, Sofia, 2011, 476 - 486. Petrova, J., Milanov, I. Reflex activity. In: Neurology. Milanov, I. ed., Medicina i Fiskultura, Sofia, 2012, 11-23. Milanov, I., Georgiev, D. Motor action. In: Neurology. Milanov, I. ed., Medicina i Fiskultura, Sofia, 2012, 24-77. Milanov, I. Pain. In: Neurology. Milanov, I. ed., Medicina i Fiskultura, Sofia, 2012, 90-99. Milanov, I. Clinical examination. In: Neurology. Milanov, I. ed., Medicina i Fiskultura, Sofia, 2012, 281-284. Milanov, I. Topalov, N. Functional neuroimaging methods. In: Neurology. Milanov, I. ed., Medicina i Fiskultura, Sofia, 2012, 300-307. Milanov, I., Kolev, P. Clinical neurophysiology. In: Neurology. Milanov, I. ed., Medicina i Fiskultura, Sofia, 2012, 344-359. Milanov, I., Daskalov, M. Turnev, I., Diseases of the peripheral nervous system. In: Neurology. Milanov, I. ed., Medicina i Fiskultura, Sofia, 2012, 456-515. Rajchev, I., Milanov, I., Bojinova, V., Velcheva, I., Deleva, H., Grigorova, O., Vasileva, T. Milanova, M. Neuroinfections. In: Neurology. Milanov, I. ed., Medicina i Fiskultura, Sofia, 2012, 529-394. Milanov, I. Degenerative diseases of the nervous system. In: Neurology. Milanov, I. ed., Medicina i Fiskultura, Sofia, 2012, 719-780. Milanov, I. Headache. In: Neurology. Milanov, I. ed., Medicina i Fiskultura, Sofia, 2012, 831-850. Milanova, А., Milanov, I. Damages of the nervous system in patients with skin diseases. In: Neurology. Milanov, I. ed., Medicina i Fiskultura, Sofia, 2012, 926-958. Milanov, I. Fatigue and asthenia. In: Neurology. Milanov, I. ed., Medicina i Fiskultura, Sofia, 2012, 994-1000. Milanov, I. Syndromes of abuse and dependence to substances and drugs. In: Neurology. Milanov, I. ed., Medicina i Fiskultura, Sofia, 2012, 1011-1022. Milushev, E., Milanov, I. Neurorehabilitation. In: Neurology. Milanov, I. ed., Medicina i Fiskultura, Sofia, 2012, 1023-1049. Milanov, Iv., Georgiev, D. Motor activity. In: Neurology. Shotekov, P., ed., ARSO Medical Publishing Company, Sofia, Bulgaria, 2015, 25-37. Radionova, M., Milanov, Iv., Shotekov, P., Dimitrov, Iv. Specific instrumental examinations of the nervous system. In: Neurology. Shotekov, P., ed., ARSO Medical Publishing Company, Sofia, Bulgaria, 125-152.